Both military and diplomatic troops are fighting for this. 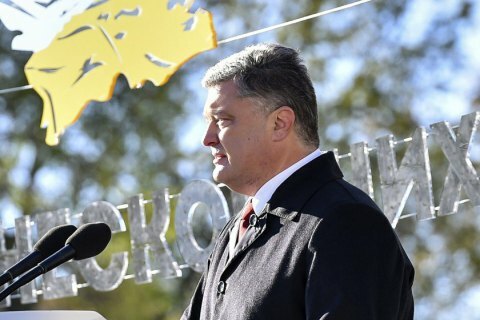 Ukrainian President Petro Poroshenko has said that Russia, as country-aggressor, and pro-Russian militants must comply with the Minsk agreements and fulfill the undertaken obligations in order to settle the situation in Donbas by political and diplomatic means. "Both in the Normandy format and within the Minsk process, our diplomats hold the opinion that political settlement must be preceded by essential, apparent, noticeable and irrefutable progress in security issues," his website quoted him as saying at the ceremony of taking oath by students of Kyiv's Ivan Bohun Military Lyceum on Day of Defender of Ukraine. He emphasized that along with servicemen who defend the borders of the state in the east, diplomats hold the line as well. "Our highly mobile diplomatic forces are true defenders of Ukraine as well. They create favorable conditions for political and diplomatic settlement in Donbas at the international negotiations of all levels," he said. One of the most recent examples is coordinated work of Ukrainian diplomacy and delegation of people’s deputies within the PACE. "It has achieved clear recognition of Russia as country-aggressor and inclusion of the item on the necessity of continuation of sanctions against Russia into the PACE resolution," he noted. "This is a common success of pro-Ukrainian international coalition, people’s deputies of Ukraine and our diplomats," he concluded.